Whether you're buying a new home or taking care of the one you're in now, good home air ventilation is important because it helps protect your health and your home. Good ventilation is as critical to your comfort and safety as a reliable heating system, a smoke alarm, or a dry basement. Good ventilation protects you, your family, and your guests from unpleasant odours, irritating pollutants, and potentially dangerous gases like carbon monoxide and radon. Well-planned ventilation also prevents the growth of mould and mildew, which can cause or aggravate allergic reactions and lung problems such as asthma. Good ventilation protects your home from damage by eliminating excess moisture from the air. Too much moisture rots window sills and attic eaves, peels paint, and invites insect infestation. Damp insulation in walls and ceilings means lost heat, higher fuel bills, and destructive mould growth. Carpeting, wallpaper, electronic equipment, and furniture all can be damaged by excess moisture. Ventilation supplies fresh air to your home and dilutes or removes stale air. There are many ways this can happen. 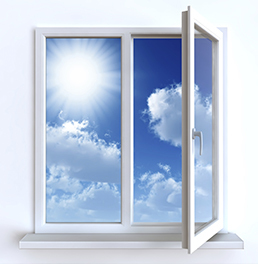 For example, opening windows to air out your home can supply fresh outdoor air that dilutes stale indoor air. Turning on the fan over the kitchen range or in the bathroom removes odours and moisture. Other common examples of home ventilation include chimneys, which remove combustion gases, and clothes dryer fans, which exhaust warm, moist air and chemicals from laundry soaps.